Cook quinoa as per directions on pack, drain and set aside. Have a large saucepan of water on a medium heat, add beetroots, cover and bring to the boil. Cook for about 20 minutes or until tender. Drain and leave to cool, then peel. Put on some disposable gloves here if you want to avoid staining your hands. Place the cooked quinoa in a large mixing bowl. Add to it the cumin, chickpeas, dates and shallots, half of the basil, half of the mint, half of the pepitas. Stir through to combine well, before adding the sliced cooked beetroot*, avocado and onion and gently mixing these through. Sprinkle the remaining mint, basil and pepitas over the top. To make the dressing, place everything into a small jug and whisk well. 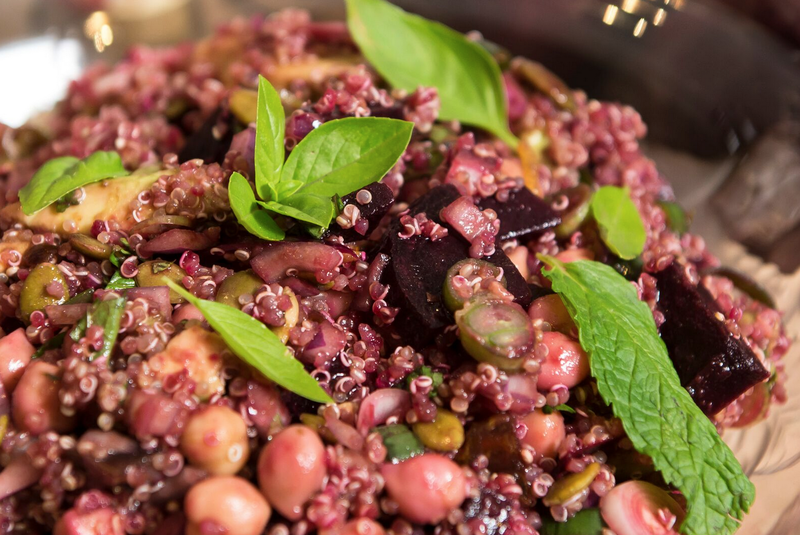 * If you’re making this salad in advance, don’t add the beetroot until closer to serving time.